Vandaag zijn beelden vrijgegeven van een kilometers lange achtervolging in december 2015. Uit het commentaar in deze video lijkt het alsof de voortvluchtige auto net buiten Vianen is klemgereden. Niets is minder waar: de aanhouding heeft ruim 60 kilometer verderop plaatsgevonden, ter hoogte van de afslag Best-West (!). 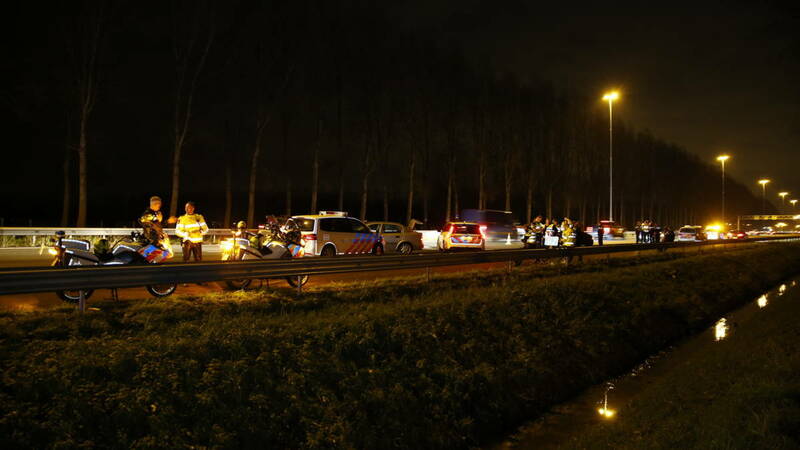 “De politie heeft na een lange achtervolging op de snelwegen A2 en A9 drie mensen opgepakt. Politieauto’s van drie regionale eenheden deden daaraan mee. De achtervolging begon in Noord-Holland, na een inbraak in Uitgeest, maar al snel was ook de eenheid Midden-Nederland betrokken bij de actie. Meerdere politieauto’s en een helikopter hebben de auto op hoge snelheid achtervolgd. We wish to thank you yet again for the gorgeous ideas you gave Janet when preparing her own post-graduate research plus, most importantly, for providing many of the ideas in a blog post. If we had known of your blog a year ago, i’d have been saved the nonessential measures we were employing. Thank you very much. I am several volunteers and also starting off a brand new system inside our community. Your web site provided us very helpful info to your workplace about. You will have completed any strong pastime and your total set will be fortunate for you. I am several volunteers and also starting off a brand new system inside our community. Your web site provided us very helpful info to your workplace about. You will have completed any strong pastime and your total set will be fortunate for you. factor to remember of. I say to you, I definitely get annoyed whilst other folks think about issues that they plainly don’t recognise about. part of other folks will leave out your magnificent writing because of this problem. is the best I’ve found out so far. However, what concerning the conclusion? Are you certain concerning the supply? Your method of telling the whole thing in this post is genuinely pleasant, every one be capable of simply understand it, Thanks a lot. My sister proposed I would personally quite possibly in this way web site product endorsement. This individual once was totally correct. This particular create actually produced this day time. You cannot think about simply how much time frame I had created spent due to this information and facts! Thanks a lot! Simply want to declare a person’s report is usually as surprising. A resolution for a submit is simply excellent so i could think you are an pro on this issue. Properly together with your authorisation permit me to to be able to clutch ones nourish to keep up to date with imminent submit. Many thanks A single, A thousand, A thousand and you should carry on a satisfying get the job done cara beli saham di bei. It’s actually a great and useful piece of info. I am satisfied that you simply shared this helpful information with us. Please stay us informed like this. Thanks for sharing. are not understanding something entirely, however this post presents fastidious understanding yet. Hello there, I found your site by the use of Google at the same time as looking for a similar topic, your website got here up, it seems to be good. I have bookmarked it in my google bookmarks. you are in reality a good webmaster. The site loading speed is amazing. It kind of feels that you are doing any distinctive trick. Also, The contents are masterpiece. you have performed a wonderful activity on this matter! Very good written story. It will be useful to anybody who utilizes it, as well as yours truly :). Keep up the good work – for sure i will check out more posts. I was just seeking this info for some time. After six hours of continuous Googleing, finally I got it in your site. I wonder what’s the lack of Google strategy that do not rank this kind of informative sites in top of the list. Normally the top web sites are full of garbage. Nice post. I study something tougher on different blogs everyday. It can at all times be stimulating to read content from different writers and apply somewhat one thing from their store. I’d favor to use some with the content on my blog whether you don’t mind. Natually I’ll offer you a link on your internet blog. Thanks for sharing. I want to express my thanks to this writer for rescuing me from such a scenario. After searching through the internet and coming across notions that were not powerful, I was thinking my life was well over. Being alive without the presence of solutions to the issues you have resolved by way of your guideline is a crucial case, as well as the kind that might have negatively affected my career if I hadn’t encountered the website. That ability and kindness in touching the whole lot was helpful. I am not sure what I would have done if I had not come upon such a step like this. I am able to at this moment look forward to my future. Thanks very much for this skilled and amazing guide. I will not be reluctant to suggest your blog post to any person who wants and needs direction about this issue. I would like to voice my admiration for your kind-heartedness for folks that really need help on the study. Your special dedication to getting the message throughout came to be remarkably informative and has regularly encouraged professionals much like me to realize their targets. The insightful guideline means a great deal to me and additionally to my mates. Warm regards; from each one of us. Hey very cool site!! Man .. Beautiful .. Amazing .. I will bookmark your web site and take the feeds also…I am happy to find a lot of useful info here in the post, we need work out more strategies in this regard, thanks for sharing. . . . . .
My coder is trying to convince me to move to .net from PHP. I have always disliked the idea because of the expenses. But he’s tryiong none the less. I’ve been using WordPress on a variety of websites for about a year and am worried about switching to another platform. I have heard fantastic things about blogengine.net. Is there a way I can import all my wordpress posts into it? Any help would be really appreciated! Needed to create you that very little word to finally thank you once again regarding the magnificent methods you have contributed here. It has been simply strangely generous with you in giving easily what exactly a few individuals might have supplied for an e-book to generate some cash for themselves, particularly seeing that you could possibly have done it if you considered necessary. The solutions as well worked as the fantastic way to realize that other people online have the identical interest really like my personal own to figure out way more on the subject of this problem. I’m certain there are several more pleasurable instances ahead for individuals that check out your website. An impressive share, I simply given this onto a colleague who was doing a little bit analysis on this. And he actually bought me breakfast because I found it for him.. smile. So let me reword that: Thnx for the treat! However yeah Thnkx for spending the time to debate this, I feel strongly about it and love studying extra on this topic. If attainable, as you grow to be experience, would you mind updating your weblog with more particulars? It’s highly helpful for me. Massive thumb up for this weblog post! After examine a couple of of the blog posts in your website now, and I really like your way of blogging. I bookmarked it to my bookmark website record and will likely be checking back soon. Pls check out my web site as nicely and let me know what you think. I’m still learning from you, as I’m improving myself. I definitely liked reading everything that is written on your blog.Keep the posts coming. I enjoyed it! It’s a shame you don’t have a donate button! I’d without a doubt donate to this outstanding blog! I guess for now i’ll settle for bookmarking and adding your RSS feed to my Google account. I look forward to brand new updates and will share this site with my Facebook group. Talk soon! Hello there! I know this is kinda off topic however I’d figured I’d ask. Would you be interested in trading links or maybe guest authoring a blog post or vice-versa? My website addresses a lot of the same subjects as yours and I believe we could greatly benefit from each other. If you might be interested feel free to shoot me an email. I look forward to hearing from you! Awesome blog by the way! Howdy would you mind sharing which blog platform you’re using? I’m going to start my own blog soon but I’m having a hard time selecting between BlogEngine/Wordpress/B2evolution and Drupal. The reason I ask is because your design seems different then most blogs and I’m looking for something completely unique. P.S Apologies for being off-topic but I had to ask! Awesome blog! Do you have any suggestions for aspiring writers? I’m hoping to start my own site soon but I’m a little lost on everything. Would you propose starting with a free platform like WordPress or go for a paid option? There are so many options out there that I’m completely confused .. Any recommendations? Appreciate it! You made a number of fine points there. I did a search on the topic and found the majority of folks will go along with with your blog. Hello, i think that i saw you visited my site thus i came to “return the desire”.I’m attempting to in finding issues to improve my web site!I assume its good enough to use a few of your concepts!! you’re truly a good webmaster. The site loading speed is amazing. It seems that you are doing any unique trick. In addition, The contents are masterpiece. you’ve done a great job on this topic! Youre so cool! I dont suppose Ive read anything like this before. So nice to find someone with some authentic ideas on this subject. realy thanks for starting this up. this web site is one thing that is needed on the net, someone with slightly originality. helpful job for bringing something new to the web! Hi there! I simply want to give a huge thumbs up for the nice information you’ve gotten here on this post. I shall be coming back to your blog for more soon. hey there and thank you for your information – I’ve certainly picked up something new from right here. I did however expertise several technical issues using this web site, as I experienced to reload the web site many times previous to I could get it to load correctly. I had been wondering if your hosting is OK? Not that I am complaining, but sluggish loading instances times will often affect your placement in google and can damage your high quality score if ads and marketing with Adwords. Anyway I am adding this RSS to my e-mail and could look out for much more of your respective exciting content. Ensure that you update this again soon..
Hey there! I’ve been following your weblog for a while now and finally got the bravery to go ahead and give you a shout out from New Caney Texas! Just wanted to say keep up the good work! future and it is time to be happy. I’ve learn this put up and if I may just I wish to suggest you few fascinating issues or tips. i like Californication because of the pretty girls and the nice music that it imparts on the show..